Hey guys! HAPPY NEW YEARS!! Now that I’ve officially finished Gossip Girl, I decided that I wanted to do a nail polish haul and mini review(?). (The reason for the question mark is I’m not really sure much of a review I’ll end up giving, it may not even be helpful :P) Once again, sorry for the low quality photos, but hopefully they get the job done. Also, sorry for the streaky photos. Some of the polishes were kinda streaky, but for others, I was too impatient for the color to dry enough before adding another coat, which made them come out kinda yucky. I’ve never made a post like this and I don’t even know how to approach it, so it might be a bit sloppy. I’ll probably have formatting issue… Always, here’s the pictures! I guess, I’ll start by giving a small review of each product, or set of products? 1) I really liked this Orly polish, as you can tell it actually works, and there is some effect. The only thing that I would have to complain about would be the magnet. It’s super tiny, and there is this little latch thing on it. I’m not sure if it’s there to rest the tip of your nail on it to get as close as possible without touching the nail or what, but I felt that it just got in the way. Also, like I said, the magnet is small and will only concentrate on the top 2/3 of the nail instead of the whole thing. So if you end up using this polish, I would just find a magnet that is roughly the size of your thumb so that you’ll be able to get a full effect design. 2/3) These are both Ulta polishes, which I happened to get for free, and I love the colors. 2 is pretty mint green and 3 is a beautiful periwinkle-ish color. The only thing is that I found that they were sorta streaky. I’m not sure if I didn’t have enough product or what, but I found that using as few brush strokes as possible worked best. 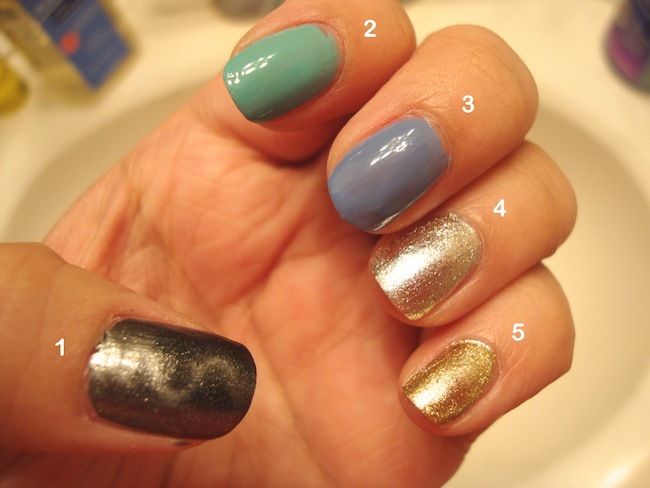 I ended up using two coats of 2, and 3 on 3. 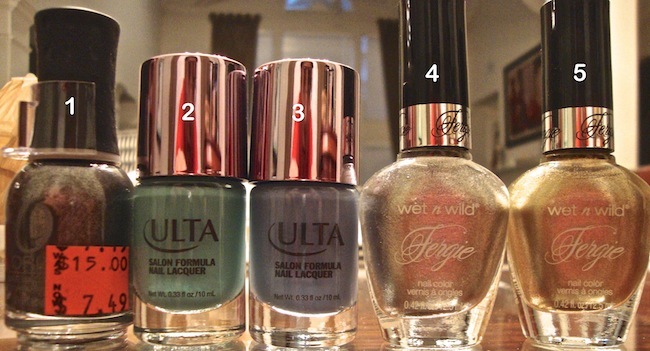 4/5) I got these from a friend, and I was surprised; I didn’t know that Fergie had a nail polish collection. Anyways, right away, I was excited about the gold because I’ve been searching for a nice gold glitter. I wasn’t as excited for the silver one because they have so many silver/glittery colors and I thought it would just look the same as some of the others I’ve seen. After, applying two coats of each, I was very pleased. The glitter is very fine, which I liked. 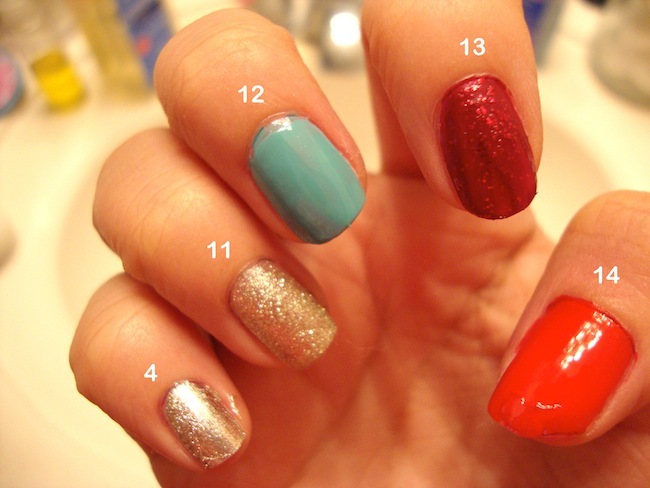 6-10) Sorry the numbers are backwards, I didn’t think about the order as I was painting my nails. 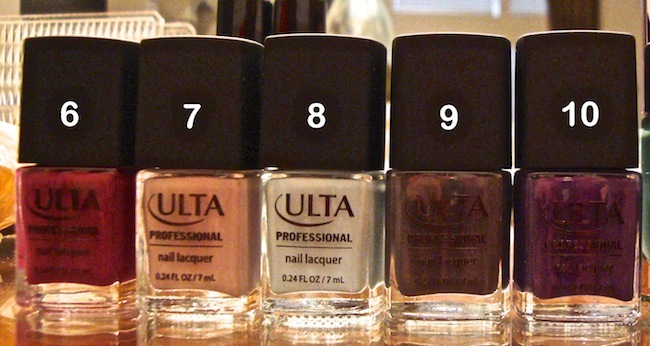 Anyways, these are Ulta polishes and some once again streaky, mainly the lighter colors like 7 and 8. 8 was the worst, with three coats you can still see parts of my nail.While I applied three coats of 8, I only two for the rest of the colors. I think my favorite color out of this set would have to be either 9 or 10. 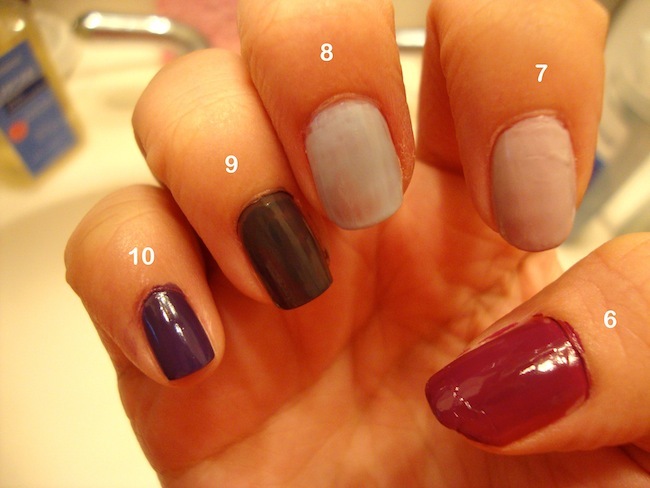 9 is a dark heather-ish gray, and is a nice dark purple. 6 reminds me of Barney purple, 7 a very light, milky mauve-y color, and 8 an off white-ish milky blue. 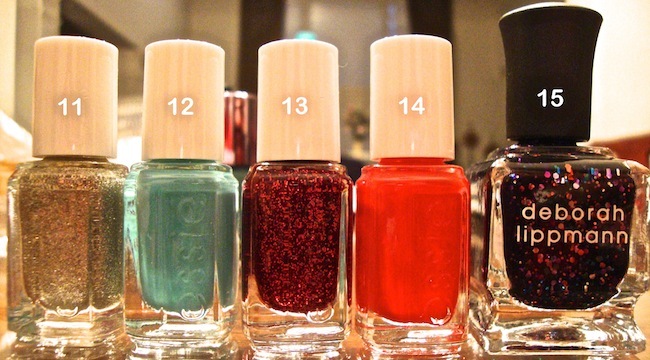 11-14) These were all Essie colors, and when I saw these, I was super excited. I especially looked forward to trying on 12 and 13. 12 is a beautiful robin egg’s blue, but not quite the Tiffany’s kind, and 13 is gorgeous ruby color with matching glitter. I think 14 just looks like a light red, nothing too special. 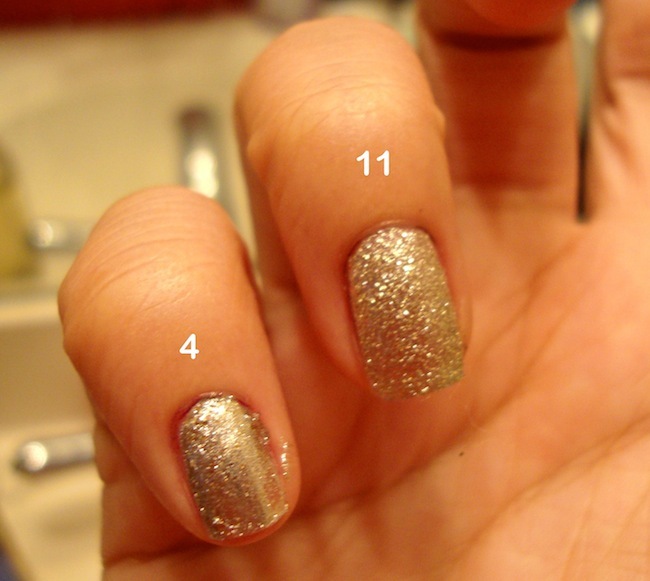 15) I included 15 in this post, but I’ve decided to dedicate an individual post to since it’s a Deborah Lippman color, so look forward to that! I hope you enjoyed this post and for those going back to school tomorrow like me, I hope you have a great last day of break!